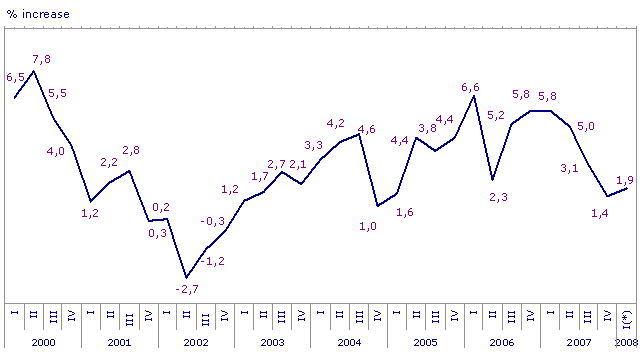 Industrial production in the A.C. of the Basque Country grew by 1.9% in January 2008 as regards the same month of 2007, in homogenous terms of the working calendar, according to EUSTAT data. Compared to the previous month, December 2007, industrial production in the A.C. of the Basque Country grew by 0.7%, once seasonal effects had been corrected. By sector, and following the classification of the major industrial sectors, the evolution of the index for January 2008 with regard to January 2007 shows growth for Capital Goods (2.4%), Intermediate Goods (3.3%) and Energy (0.3%). Consumer Goods decreased by 4.0%, as a result of the decrease suffered by Consumer Non-durable Goods (-0.8%) and especially by the fall of Consumer Durable Goods (-11.3%). Inter-monthly variations in January 2008, in relation to December 2007, were positive for the major sectors of Energy (7.0%), Capital Goods (1.8%) and Intermediate Goods (0.3%), while Consumer Goods fell by 4.3% as regards December 2007. Of the two component parts of Consumer Goods, Consumer Durable Goods experienced an inter-monthly decrease of 10.8%, while Consumer Non-durable Goods fell back by 1.4%, in comparison to last December. By province, the inter-annual evolution of the Industrial Production Index followed a positive pattern in Gipuzkoa, with 3.1%, and in Bizkaia, with 2.2%, while in Álava the index decreased by 0.9%. The inter-monthly growth rates, January 2008 in relation to December 2007, of the provinces showed differing patterns of evolution, growing by an inter-monthly 1.6% in Gipuzkoa and 1.4% in Álava, but decreasing in Bizkaia by 0.5%, over the same period. Methodology note: The Industrial Production Index for January 2008 was produced using the new base 2005 and thus succeeds the previous base 2000. This change of base has meant, among other improvements, the updating of the representative panel of informing companies from the industrial sector of the A.C. of the Basque Country, substantially increasing its number and sectorial coverage.